As design after design floats across runways around the globe, the world still reels from the death of British fashion designer Alexander McQueen. It has been more than 10 days since McQueen’s untimely passing but I felt it would be appropriate to reflect upon his contributions to the fashion world. McQueen was a pioneer in the fashion industry. He was able to seamlessly meld tough, Gothic motifs with soft feminine elements. The effect is nothing short of ethereal. 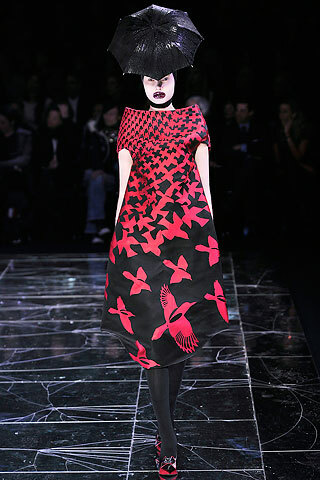 When he exhibited his spring 2010 collection he said, “I’ve always been fascinated by the Victorian period of death where they used to take pictures of the dead.” I remember my first encounter with Alexander McQueen’s designs in the pages of Vogue when I was about 15 years old. The designs conjured up mental images of a trunk forgotten in an attic– the decaying lace of an old wedding gown. Victorian. Macabre. Brilliant. 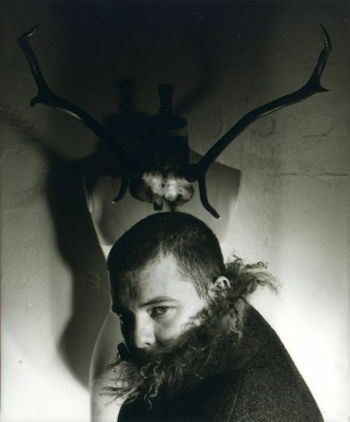 McQueen’ was outspoken both in his design and in his wit. My favorite anecdote is that he famously sewed obscenities into a coat he designed for Prince Charles. His fall 2009 collection was surrealist in nature with latex smears for a mouth and Escher-esque tessellations running across structured conical dresses. His most recent collection, Spring Ready-to-wear 2010, entailed structured mini dresses, surreal shoes, snake-skin patterns, and Lady Gaga glitz. With regards to mainstream success, we can thank McQueen for low-rise jeans, skull print scarves, and Lady Gaga’s envelope-pushing fashion. In an ever-evolving industry, the fashion world will move on in the aftermath of loss. 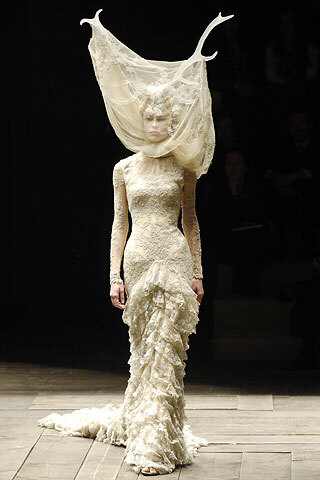 Alexander McQueen, however, provided designs that transcend the trend. As a “foreign correspondent” for Avant Gaudy during my one month stay in Paris for a fashion design program, I have been able to get the scoop on what’s hot in Paris. I had the opportunity to go backstage for an awesome haute couture fashion show featuring designer Georges Hobeika. Hobeika is a Lebanese designer with a background in French fashion (He interned with Chanel and other major French designers). He opened his haute couture label in 1995, specializing in evening gowns, wedding dresses and suits. He now has a ready-to-wear line featuring several flowy, draped dresses. Although haute couture is mostly popular in Paris, the extensive detailing and craftmanship can be an inspiration to everyone. I was actually able to help dress models wearing gowns that cost well over $100,000. There’s only a small percentage of people who can actually buy these kinds of dresses. The rest of us just admire them for the works of art they truly are. Check out Hobeika’s website at: www.georgeshobeika.com.